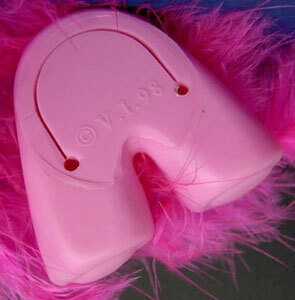 "Clip me on for fashion fun!" 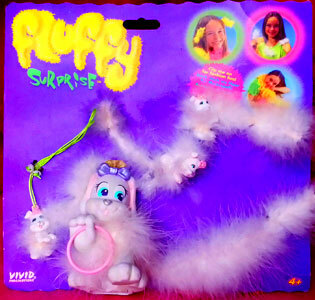 Fluffy Surprise were produced by Vivid Imaginations in 1998-99. 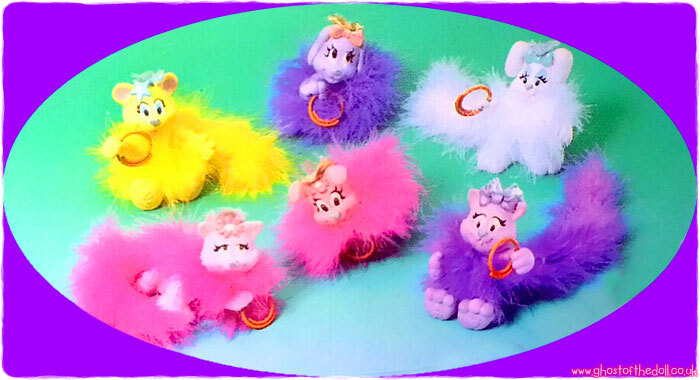 They were a short lived series of animals with feather boa type trims. 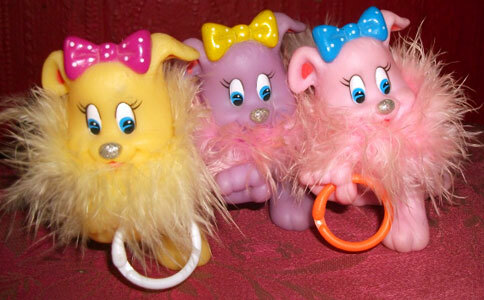 Each adult character came holding a hoop (through a hole in one of their paws, with a split in the middle to remove it) which could be looped onto things. There were also various babies. 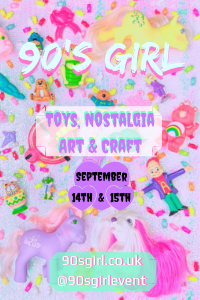 Images on this page thanks to sauerkirschmarmelade, Spiral Blog, vanillascoop, miss_tuneful, Valeria, Louise P, Nappercasper, snaky, Jana, BackToTheToys, ToyAdventures, and eBay sellers vasia614 , Fifis-Fleamarket , kallum1999 , funky_fifi and questo.ce.l.avevo.shop ! 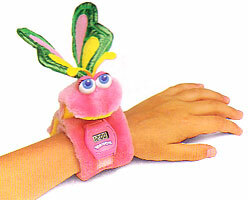 "Each Fluffy Surprise comes with a special surprise that you can wear! 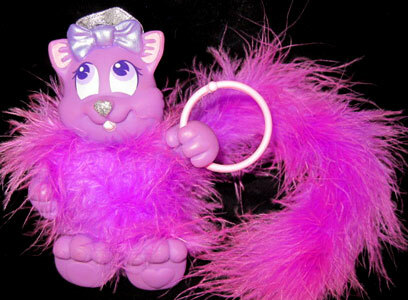 Fluffy Surprise loves being with you, attach their clips to your purse or to your backpack, and they'll follow you everywhere!" 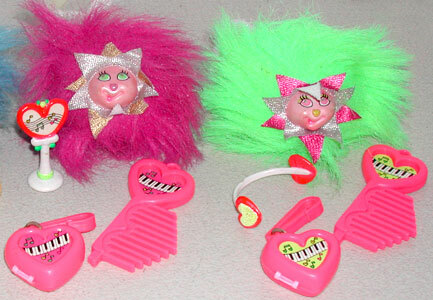 There were six characters in the 1998 release, and each one came with a surprise accessory inside their bases (accessible via a flap). There was a bear, two cats and two dogs. 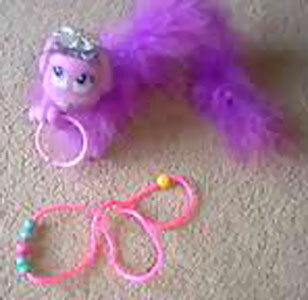 The surprise gift was either a friendship bracelet, necklace or hair bobble. 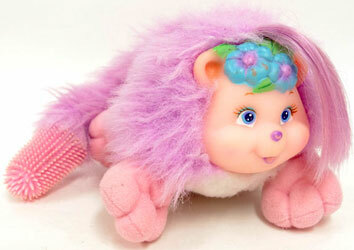 "Five great new Fluffies to collect! Each with hot colours, cool dazzling boa and the sweet scents of oranges, strawberries, lemons, cherries and apples! 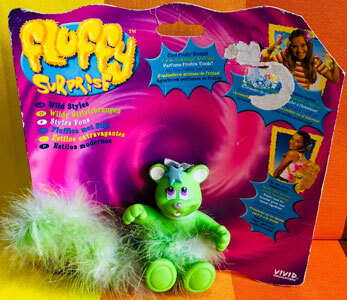 Each Fluffy also has a secret fashion surprise inside!" 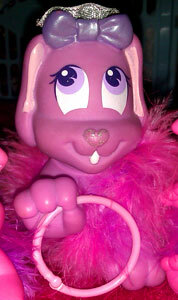 Second release in 1999 saw the addition of a rabbit plus new colours and all were scented. 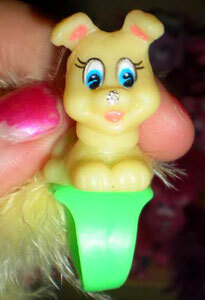 The surprises inside were also new. 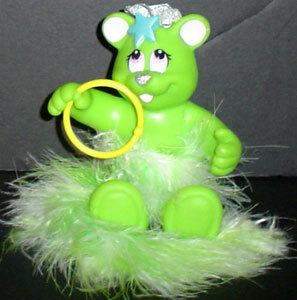 There was one pose bor the bear, with two different eye positions. 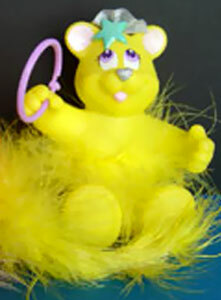 The yellow bear from from the first release. 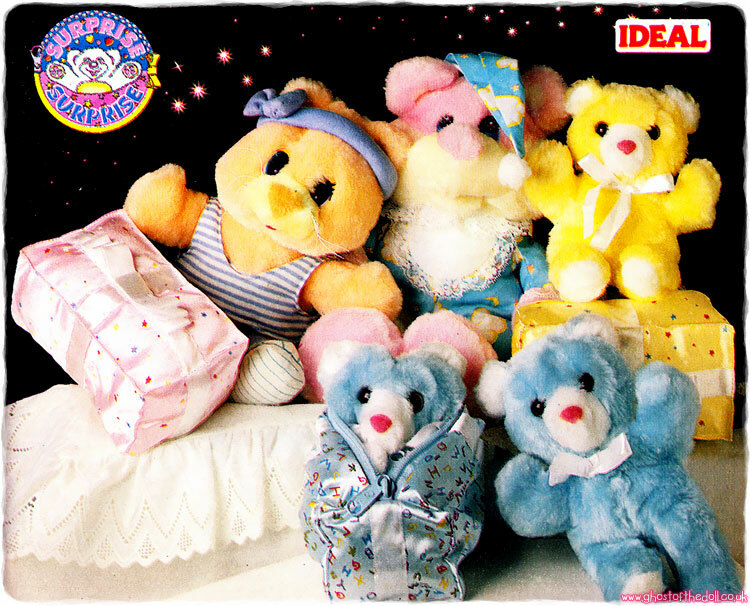 These two bears were from the second release. 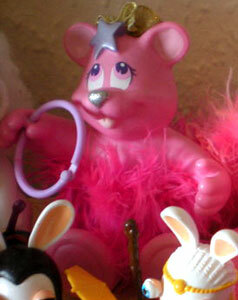 The pink bear came with the Scribble Fashions set. There were two different posed cats, one of which had two different eye posistions too. 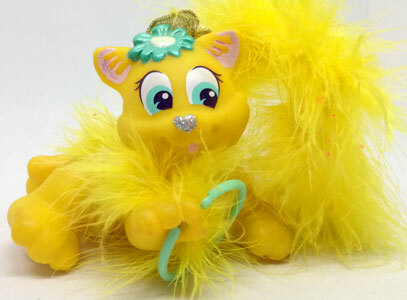 The yellow cat came with the Hair Fashions set, and was made using the same mould as the pink cat above. There were two different posed dogs produced. 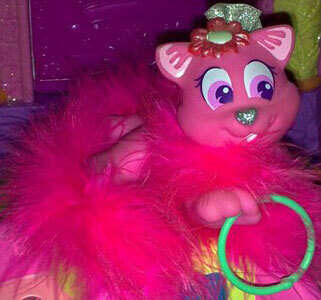 The hot pink version is from the second release. 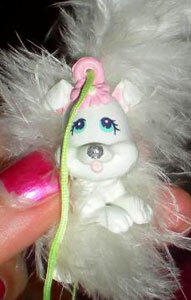 The white dog came with the Jewellery Fashions set. 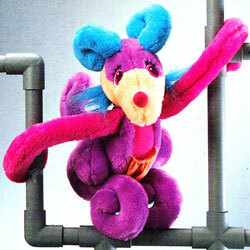 She used the same mould as one from above, but with different eyes. 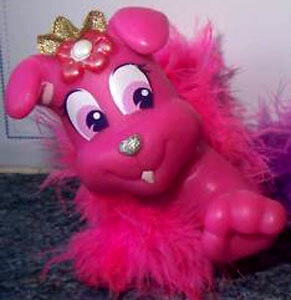 This hot pink rabbit was from the second release, possibly the only colour and pose produced. 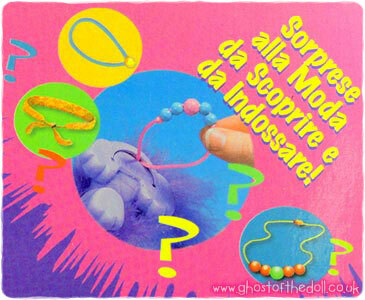 These are the first release front packaging images, UK/Euro and Italy. 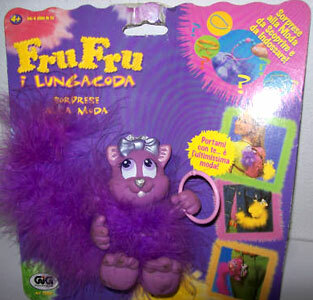 This is the second release Euro front packaging. This is the UK/Euro first release back packaging. 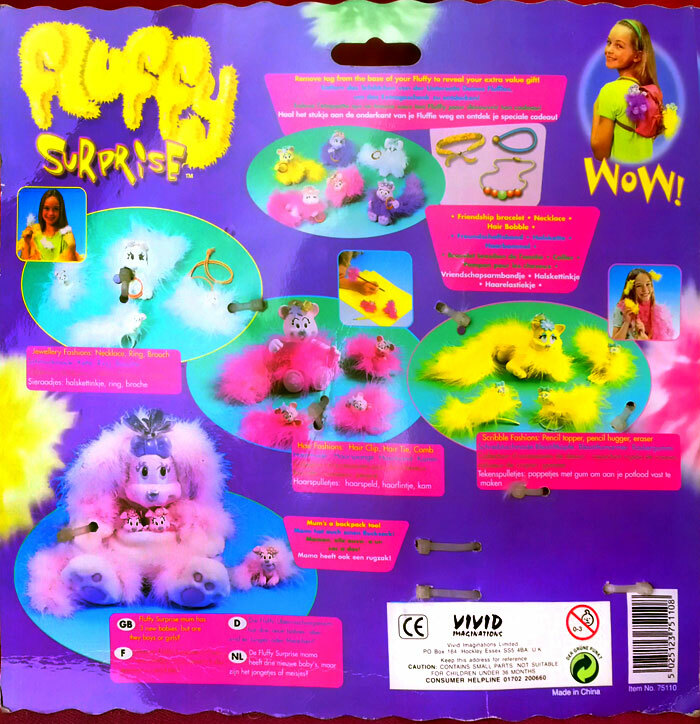 In Italy, Fluffy Surprise was produced with Gig. 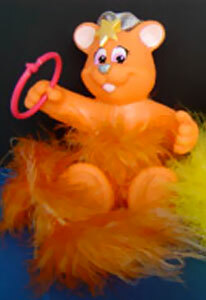 The six individual characters also had names. 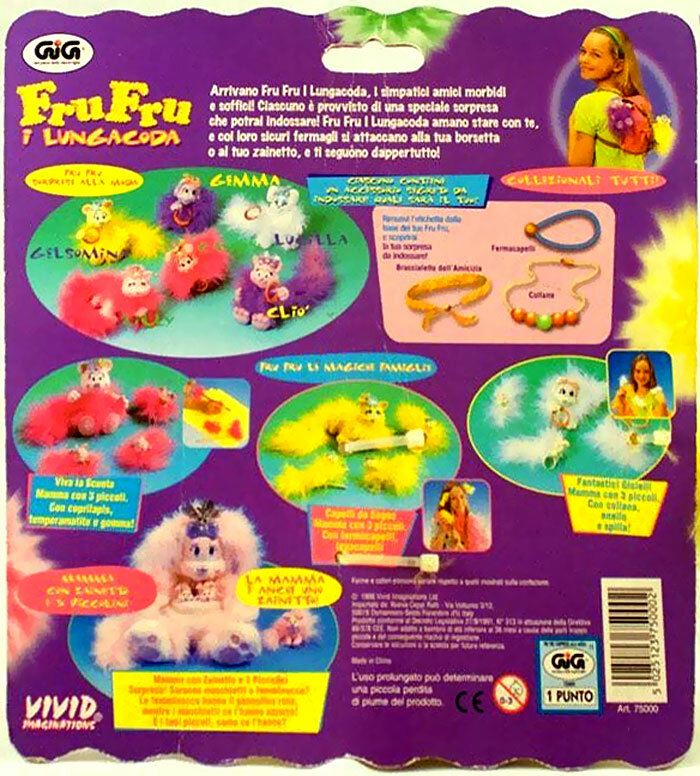 This is the Euro second series back packaging back. 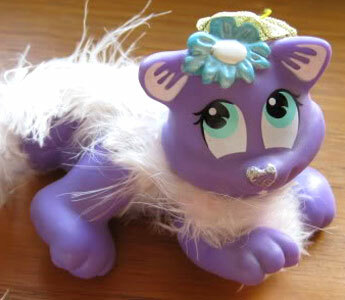 It's possible these are knock-offs as they have no manufacturing marks. 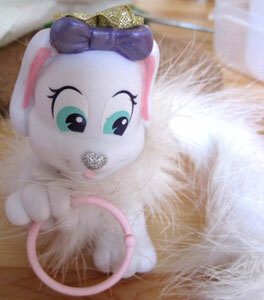 This puppy is also a ring, but has no hair bow like the VI version.